WEEKEND PREVIEW is your weekly guide to events in Thurston County. This week, Olympia has enough musical performances to keep you entertained from morning till night! And don’t worry, we’ve got the inside scoop on all the concerts and theater productions around town, so you don’t have to worry about a thing. Just sit back and enjoy the show! Delight in the eclectic sounds of world-renowned musicians The Donny McCaslin Quartet at the Minnaert Center for the Arts. Celebrate “Music in Our Schools” month with the Thurston Education Foundations’s Faculty and Friends Concert at Koval Performing Arts Center. Let the sounds of timeless opera carry you away at SPSCC’s French Masters at the Minnaert Center for the Arts. Vote for the “Audience Favorite” at the annual sing-off Harmony Sweepstakes A Cappella Festival (Masterworks) at The Washington Center. Appreciate the musical mastery of harpist Bridget Kibbey of Emerald City Music at The Evergreen State College Recital Hall. Enjoy a healthy dose of folksy rock with the Indigo Girls at The Washington Center. Relax to the soothing sounds of SPSCC’s winter choral concert Memory and Light at the Minnaert Center for the Arts. Welcome the new season at Olympia Symphony Orchestra’s Spring Freshness concert at The Washington Center. Celebrate the 332nd birthday of Johann Sebastian Bach at St. John’s Concert Series: Bach at St. John’s Episcopal Church. Follow your friends down the rabbit hole while watching an original adaptation of Alice in Wonderland at Olympia Family Theater. Tap into the visceral at Kevin Snipes’s artist talk and demonstration Pottery and Otherness at South Puget Sound Community College. Laugh alongside Alex “The Zaniac” Zerbe as he brings dancing, singing, juggling and magic to the stage of Capitol Theater. Unravel the mysteries behind Agatha Christie’s The Mousetrap at Standing Room Only in Yelm. Delve into the chaos and complications of The Understudy at Harlequin Productions. 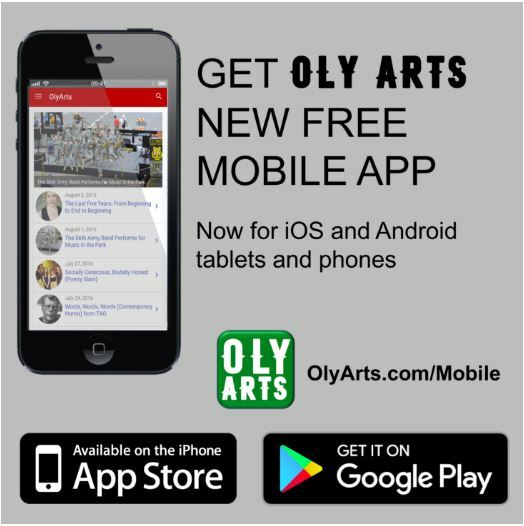 To receive a regular update on upcoming events, subscribe to OLY ARTS’s weekly, emailed newsletter.